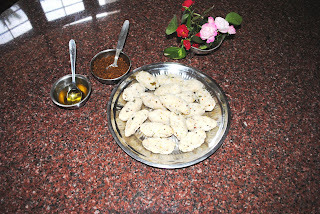 I know it is a terribly tongue twisting word, however it is one of the delicacies of the South Indian Brahmin communities. It is quite easy to make, and it is made out of powdered rice and coarsely powdered Tuwar dhal, grated coconut along with green chillies/ red chillies and ginger, salt and Hing. It is first made like upama, and then shaped with hands and steamed in the cooker like the regular idlys. One can have it Sambhar, Coconut chutney, or just with the wonderful tasting Mulagai podi (Special red chilly powder with sesame oil). It is a healthy, wholesome dish. Tell me does it look and sound interesting? Yes, it looks and sounds wonderful! But please tell me what the heck is a "steam cooker"? Is this a kitchen gaget I should have? What can be done with it? I am always interested in new foods and how to prepare them! 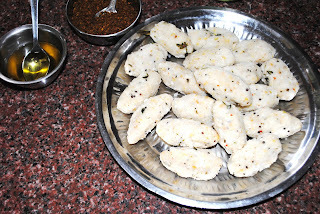 Looks like idli gujhias to me but the way you describe it, it sounds interesting. Never did hear of this dish before. Oh, looks delicious Rama:) I have had Kozaikatais before, but not like this one. I love Uppama too, so know that it would taste great:):) I would love some with a little chutney and mulagai podi please...yummy! It looks yummy and sure it would have tasted like heaven.. may be I will try it out tomorrow! My wife and daughter love south Indian food though my daughter never lived in India and we don't cook south Indian food at home. 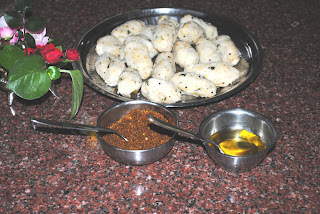 But she made my wife bought equipment to make Idli and occasionally demands Doss and other food that I don't even know. Mami fdeel like eating NOW!!!!!!!!!!!!!!!!!!! Looks delicious!!!!!!! Only wished I lived closer so I could come over and taste this!! It was superb, Rama. I was most inspired by your post and made it right away!! YUMMMY!!!!!! Somebody had asked for proportions. Splutter mustard seeds, chana dal and chillies. Add 5 cups of water. Bring to boil. Add hing and coconut to this and salt it. Add 2 cups of idli rava slowly. (crushed rice NOT fine rice flour). You may have to add a little less or a little more. Keep mixing as you are adding the idli rava otherwise it will clump. Let it cool. 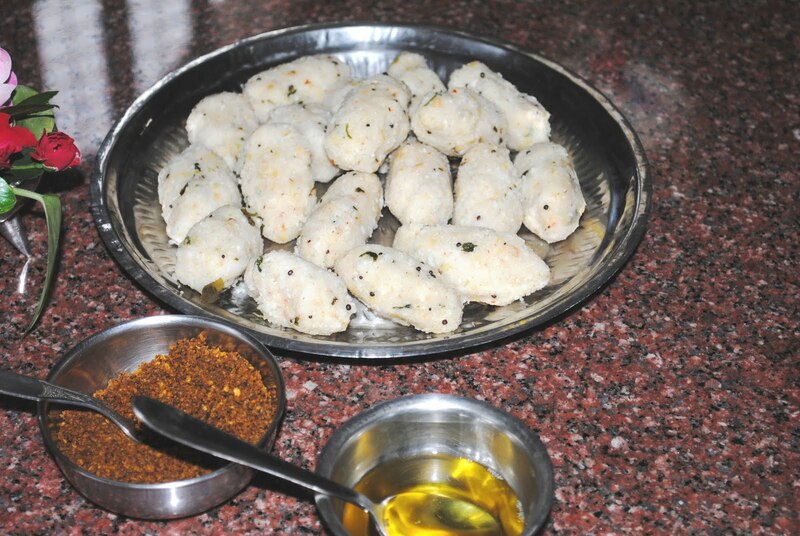 Make balls and steam in the idli paatram. Enjoy. I like upma.. so will try this smtime. 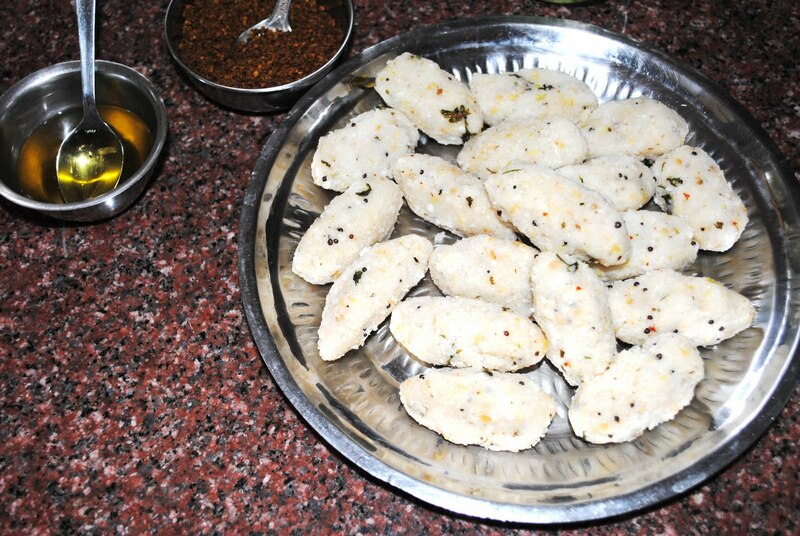 I love South Indian food and so does my family .My favorite food are idlis and utthapams .Surprisingly i never saw or heard of Kozhukatai before .Looks yummy to me .I don't think this dish is available in S.I . food joints like Woodlands .